Nothing is more daunting than opening up a 3D application for the first time. In fact, the most difficult part of the learning curve is getting started! 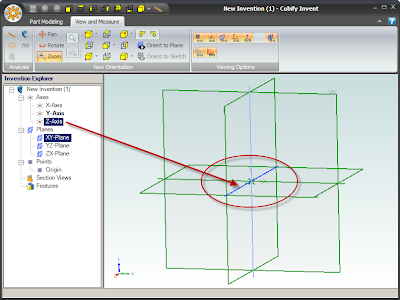 In this post, and companion video, along with the series of which it will be a part, we attempt to fill in the blanks of the basics of learning general 3D design and Cubify Invent in particular. I have yet to open a new 3D application that comes up with an instantly intuitive interface that guides me into what I should do to begin using the application. 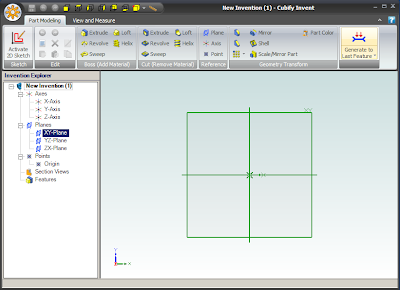 Cubify Invent is no different than any of the other 3D applications in this respect. We are presented with a box intersected by two lines and some buttons along the top that don't do anything at this point. No wonder it's so hard to get started! But, there is a clue lurking on the left side of the screen. There is a tree diagram in a box labeled "Invention Explorer". It is this area that gives us our first indication that we are in a 3D application. 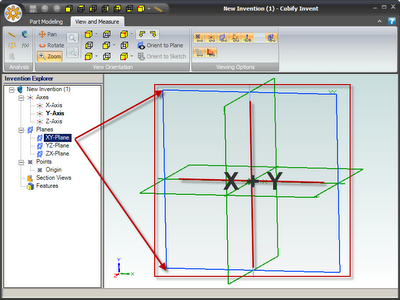 And, that is indicated by the first branch of the tree labeled "Axes"
Cubify Invent is a 3D Computer Aided Design (CAD) program. 3D stands for 3 Dimensional. Each of these three dimensions in which we will be working is represented by an AXIS. We can see these listed under the branch labeled "Axes". These three axes represent the three directions that make up our working design space. Each direction is represented by a single line that helps us orient ourselves in 3D space. It provides an anchor or focal point which we can use for measurements. The axes are identified as X-Axis, Y-Axis and the Z-Axis. 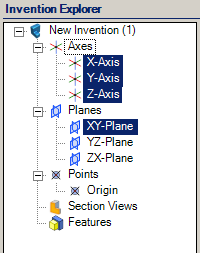 Clicking on the Y-Axis entry in the Invention Explorer turns the line representing the Y-Axis blue. This line is perpendicular to the X-Axis and generally represent UP and DOWN travel. 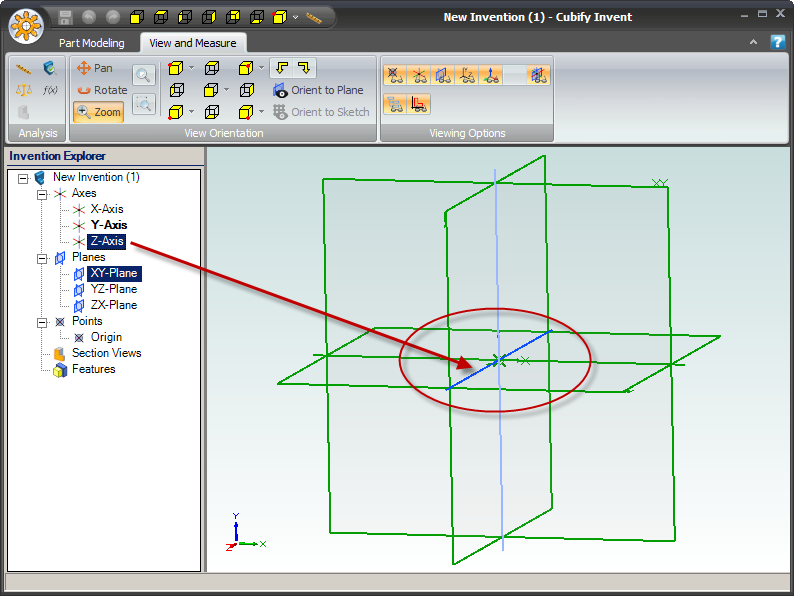 The Z-Axis is hidden to us when we first enter into Cubify Invent. We have to rotate the view by holding the left button on the mouse while dragging to the left or right. 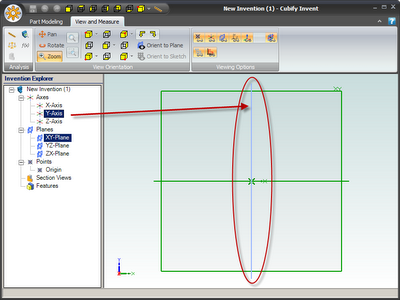 The Z-Axis is what sets a 3D application apart from a 2D application. It allows us to provide a way to lift items off a flat surface and locate them anywhere in space. If we are going to be able to precisely locate or measure the items we design, we must have an anchor from which to make our measurements. In a 3D application, this anchor is called the "ORIGIN" and it is the point where all the Axes cross. At the origin, the measurement values for each axes are equal to zero. Starting at the origin and going in one direction will result in positive values and going in the opposite direction will result in negative values. For instance, in the following illustration we show the affect of moving left or right and up and down along the X and Y axes. At the Origin, X = 0 and Y = 0. As we move to each quadrant we will be moving in some direction away from the origin. In the upper right quadrant, both X and Y will be represented by positive values. But, in the lower left quadrant, both X and Y values will be negative. It is important to remember that an axis continues in both the negative and positive directions to infinity. 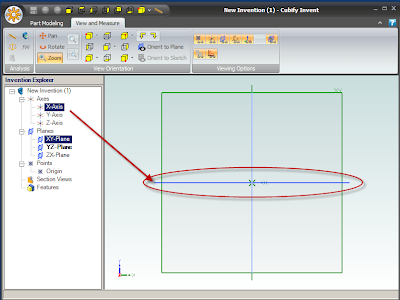 The length of an axis is not limited to the length of the lines on the screen representing that axis. These lines are simply there to help orient us in space. But, they do NOT limit the actual axis values available to us. A plane is a flat surface that is defined/constrained by the combination of two axes. Like axes, planes actually extend into infinity. 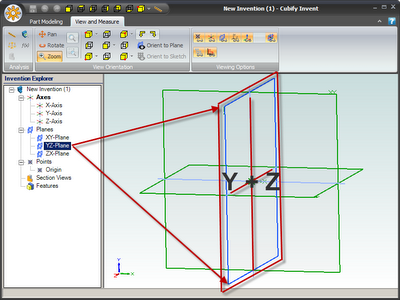 The boxes that represent planes in Cubify Invent are simply tools to help us visualize these surfaces. But, the boxes do NOT limit the extent of the plane. By measuring along both the X-Axis and the Y-Axis, we find that each combination of points that are plotted follow a pattern that forms a flat surface. This 2 dimensional flat surface is called the "XY-Plane". A typical 2D paint program is limited to an XY-Plane. We can move to the left, right, up and down on this plane. But, we cannot move backwards and forwards. 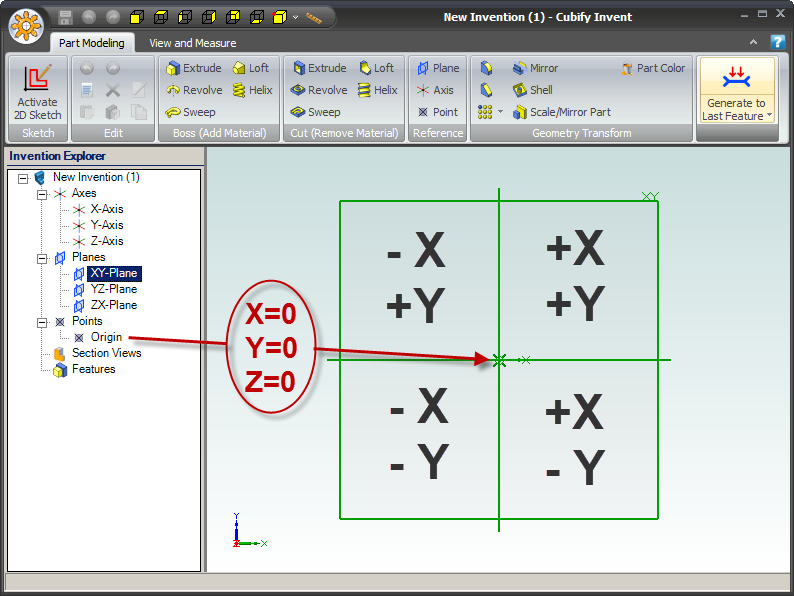 The Z-Axis is always zero in the 2D XY-Axis. 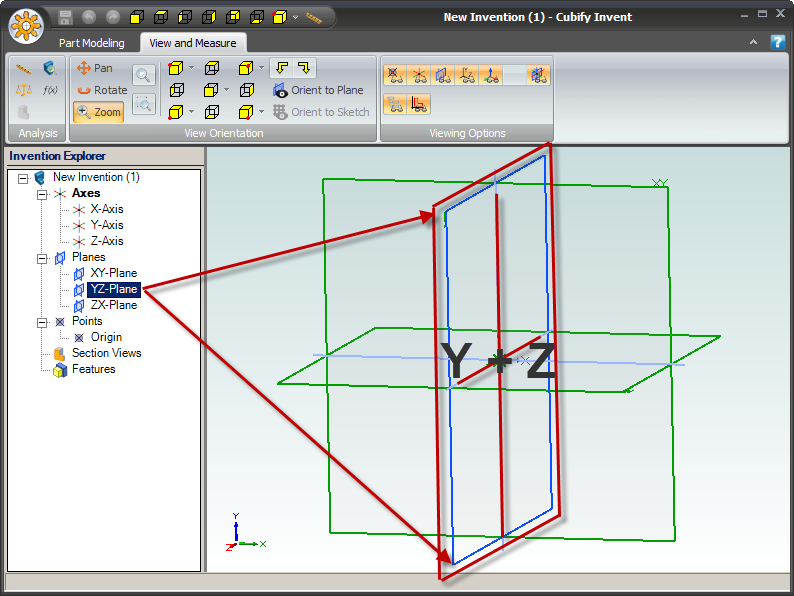 There are two other 2D planes used by Cubify Invent to help us create objects in 3D space. 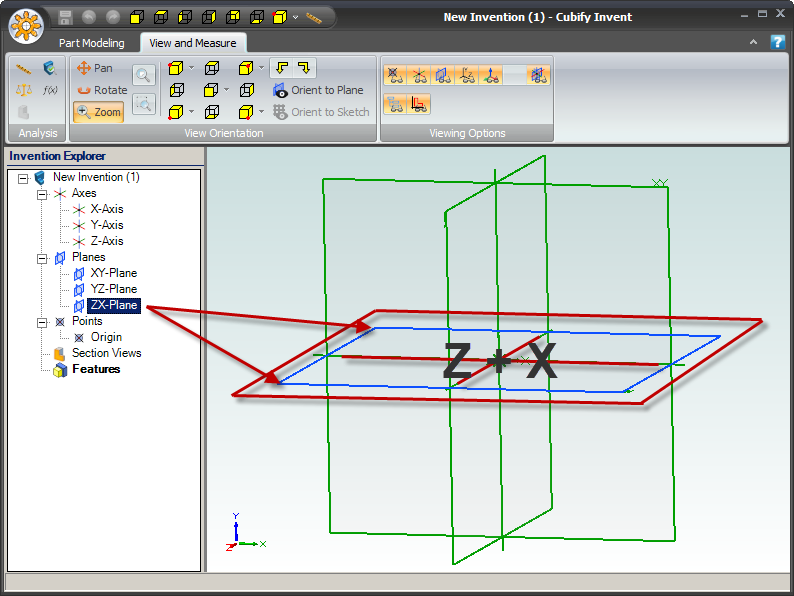 Measuring along both the Z-Axis and the Y-Axis, we form the flat 2D plane called the ZY-Plane. 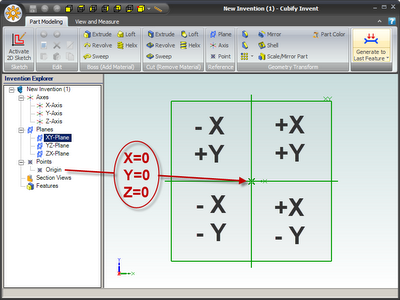 In the ZY-Plane, the X-Axis value is always zero. We can only change Z and Y values. We can move Up or Down and Forward or Backward in the ZY-Plane. 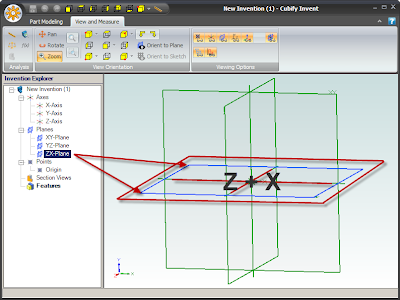 The ZX-Plane is created by combining the ability to measure distance To and From us via the Z-Axis with the ability to measure Left and Right along the X-Axis. The Y-Axis value is always zero on the ZX-Plane. Virtually everyone is familiar with 2D drawing programs. 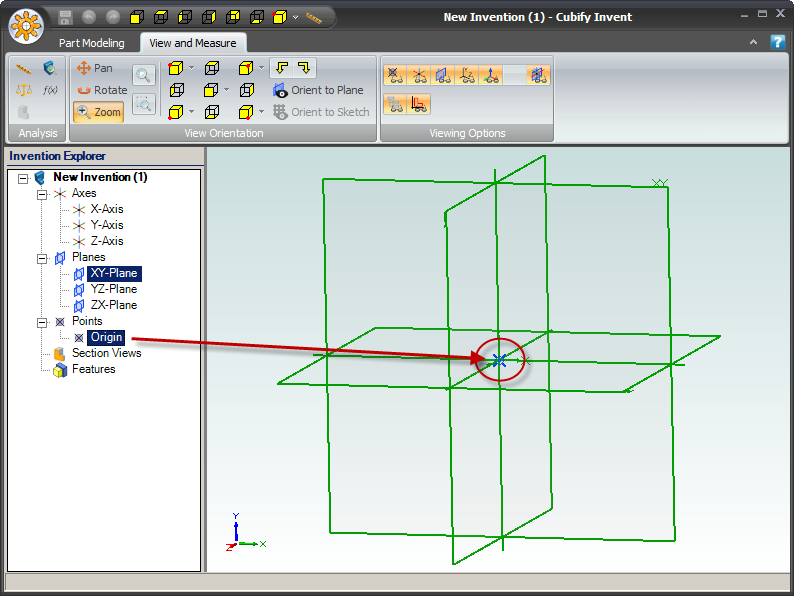 And the Cubify Invent developers decided to capitalize on that familiarity to facilitate creating 3D objects. They did this by allowing us to draw 2D objects on any one of the 2D planes as 2D sketches that are then manipulated in a 3rd axis to create the final 3D object. 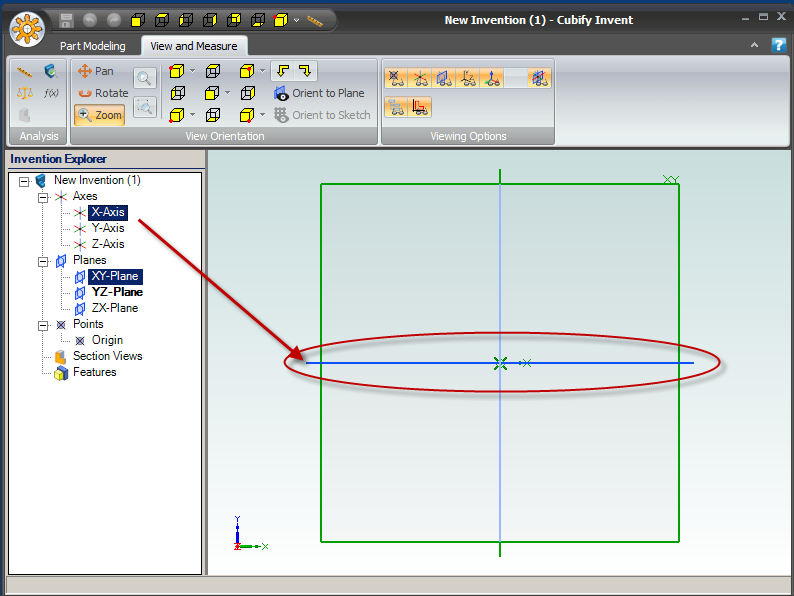 When we sketch a circle on the 2D XY-Plane and then "Extrude" it, we are adding a Z-Axis value to the original sketch having only X and Y values. But, first, here is a video tutorial that covers what we have discussed here in more detail. I hope this has been helpful to those completely new to 3D design applications. 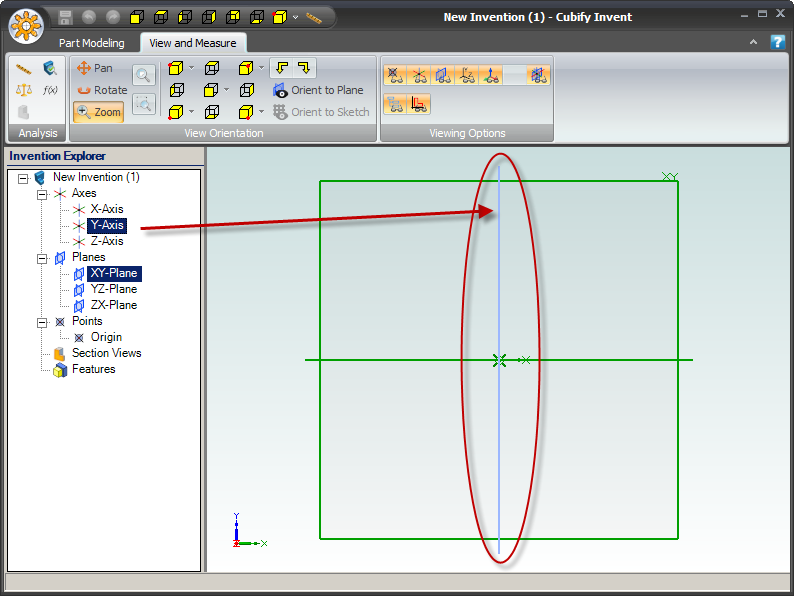 While I have to admit that starting in a 3D "view" that cannot be used until we first drop down into a 2D sketch view is counter-intuitive. But, there is a method to the madness. And, ALL 3D applications have the same difficulty when it comes to getting started for that very first time. 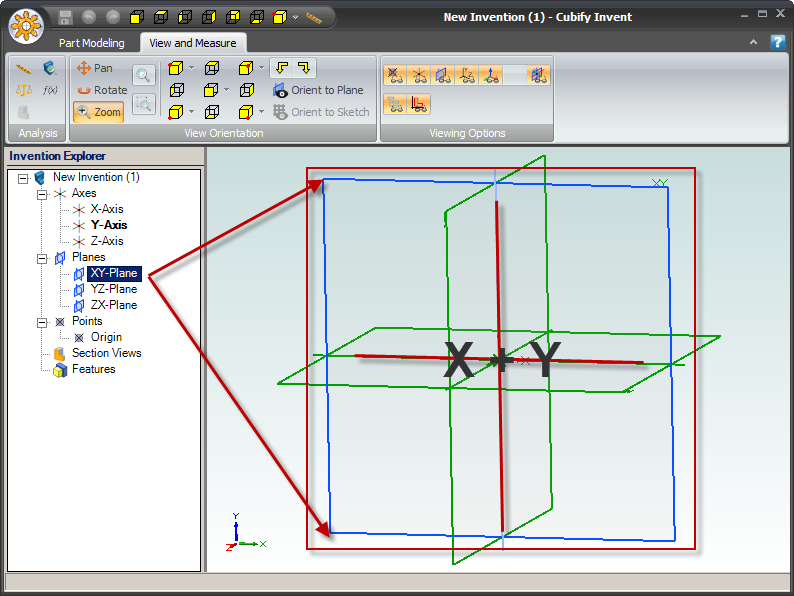 And, in the long run, Cubify Invent is a LOT more intuitive at other levels once we get beyond the initial conceptual hurdles. Tom: looks like Cubify Invent now comes with a 60-day free trial instead of 15! Apparently, I am not the only one to point out that 14 days was too short a period to properly evaluate Invent! Thanks for letting me know! I'd not heard that until you posted it. 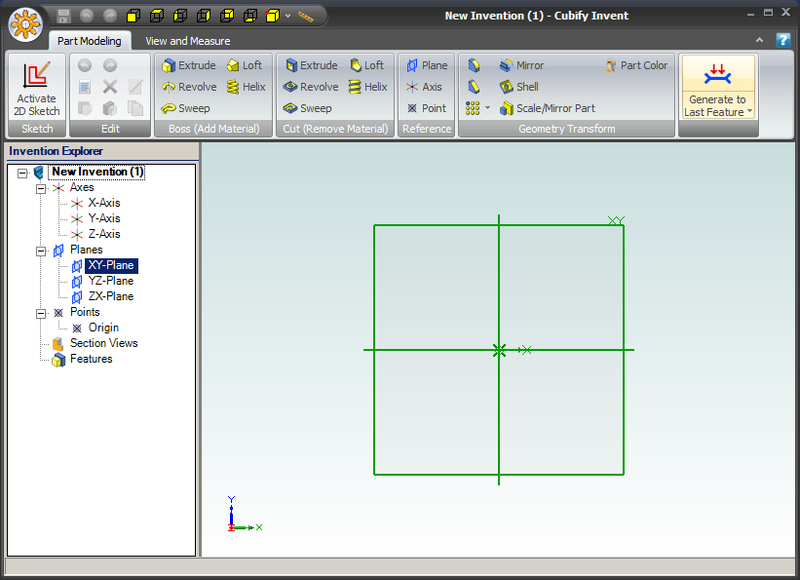 Seems to me that the cubify website implies that INVENT program is part of the CUBE printer as is CUBE software. I guess you gotta pay an additional $50 to make CUBE usable. So much for clear communication. 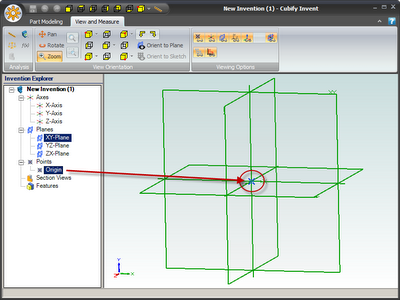 The Cube comes with a piece of software called the "Cubify Client" that converts STL files into printable .Cube files. Cubify Invent is a separate purchase of $50. Now, about customer service. I know that the management of 3D Systems is very committed to HIGH levels of customer service. So, if you have specific things where you think you have not been treated well, please let me know by emailing me at the address in the "Personalizing Help" section to the right. Thanks Tom, I've started with your Moi3 tutorials, and just saw this. Thanks for great videos that make using this software much easier. In the end, MOI is a much easier product to use. As my granddaughters grew up, they would search the racks of cups, etc. at places like Cracker Barrel, gift shops and toy stores to see if they could find an item with their name on it. They always came up empty. They could never find a personalized item. 3D printing has solved that problem in our family. But, what if you don't have a 3D printer. software or time in which to create a personalized 3D item? In that case, I would like to help. Just send me a request and, if possible, I'll try to design the personalized item for you. Any resulting design will be made available for you and others to download from the Cubify.Com store. Designs will be priced at the lowest current cost permitted on Cubify.com.